Lieutenant General Berger was commissioned as an infantry officer in 1981 following graduation from Tulane University (BS Engineering 1981). As a Lieutenant and Captain, he served as platoon commander in the 1st Marine Division, and later as Company Commander and Battalion Operations Officer in the 2nd Reconnaissance Battalion during Operation DESERT STORM. He also served as Officer Selection Officer in Roanoke, Virginia. As a field grade officer, Lieutenant General Berger was an instructor at the Marine Aviation Weapons and Tactics Squadron One (MAWTS-1) in Yuma, Arizona; instructor at the III Marine Expeditionary Force Special Operations Training Group; and served on the Joint Staff as a policy planner in the Strategic Plans and Policy Directorate, J-5. Lieutenant General Berger commanded the 3rd Battalion, 8th Marines from 2002 to 2004, deploying the battalion, first to Okinawa, and later to Haiti in support of Operation SECURE TOMORROW. As a Colonel, Lieutenant General Berger commanded Regimental Combat Team 8 in Fallujah, Iraq during Operation IRAQI FREEDOM. While serving as Assistant Division Commander of 2nd Marine Division, he was appointed to the rank of Brigadier General. He then deployed to Kosovo, where he served for one year as Chief of Staff for KFOR Headquarters in Pristina. From 2009 to 2011, he served at Headquarters, U.S. Marine Corps as the Director of Operations in the Department of Plans, Policies, and Operations. In 2012, he deployed to Afghanistan as the Commanding General of 1st Marine Division (Forward) in support of Operation ENDURING FREEDOM. In July 2014, Lieutenant General Berger was promoted to his current rank and assumed command of I Marine Expeditionary Force and subsequently assumed command of U.S. Marine Corps Forces, Pacific. 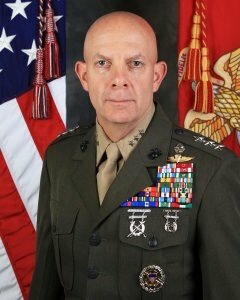 On 28 August 2018, Lieutenant General Berger assumed responsibility as the Commanding General, Marine Corps Combat Development Command, and the Deputy Commandant for Combat Development and Integration, Headquarters, U.S. Marine Corps. In addition to a B.S. in Engineering, he holds a Master of International Public Policy from Johns Hopkins University School of Advanced International Studies, and a M.S. in Military Studies. His formal military education includes the U.S. Army Infantry Officer Advanced Course, U.S. Marine Corps Command and Staff College, and U.S. Marine Corps School of Advanced War-fighting. He is a graduate of the U.S. Army Ranger School, Jump-master School, U.S. Navy Dive School, and U.S. Marine Corps Amphibious Reconnaissance School. Editor’s note: When General Berger’s appointment is confirmed he will be the second USMC Commandant to pass through Tulane University. General Robert Barrow, Commandant 1979-83 had previously served as the Professor of Naval Science at Tulane Naval ROTC. With over 2000 officers commissioned since our first class in 1941, Tulane Naval ROTC has produced 11 Navy Admirals and 2 USMC Generals.